In our facility, corrective exercise and strengthening exercise is an important part of our treatment of patients. In the world of health care, Doctors make treatment decisions that must take into consideration the benefits versus the risks of a specific treatment or procedure. For example, a medication may improve certain symptoms, but may create other, potentially severe, problems for some people. Therefore, the benefits of ANY treatment or procedure must always be weighed against the risk of additional problems or damage. When the risks of a treatment outweigh the expected benefits, then that treatment needs to be seriously questioned, if not abandoned in favor of something different, better, or safer. The same is true of all decisions we make in life. We weigh benefits against risks. And that should certainly be a consideration when selecting exercises for your personal exercise program. Whether you are exercising for general fitness, sports performance, bodybuilding, or injury rehabilitation, there may come a point in which a decision must be made as to whether certain exercises or activities are really worth doing. With the passage of time, particularly if you have been engaging in rigorous workouts without expert coaching or, at least, periodic supervision, you may find that one or more exercises causes pain in a joint, muscle, tendon, or a certain body area. Chronic pain/injury may have now established itself after performing certain exercise(s) on an ongoing basis. As early as possible, pain or problems need to be recognized and the reason(s) for them should be accurately determined. People visit our office to find out these reasons and get things fixed. Many times pain and injury develop as a result of performing exercises with improper or sloppy form, from performing exercises too rapidly, or from improper or excessively heavy weight/resistance selection. We are not surprised to find that even those people with years of exercise experience have convinced themselves they are performing their exercises optimally, when, in fact, they really are not. In some situations, we get too strong for our own good and this leads to problems. Unfortunately, the ego can often interfere with an honest self-examination of proper methods and procedures when it comes to exercise performance. This is why an objective evaluation by a professional that is truly experienced in exercise, strength training, and injury can be very valuable. In other situations, wear, tear, and injury develop because some people are simply not mechanically suited for certain exercises. Inevitably, it should be evident that performing some exercises are just not a very good idea. 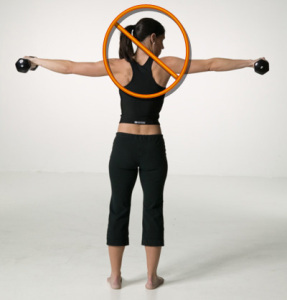 For example, a person with neck or shoulder pain is likely to aggravate their situation by doing barbell presses behind the neck. Similarly, a person with lower back trouble is not well advised to be deadlifting or squatting heavy….particularly with incorrect form. Often, people visit our office reporting that they only feel pain with a specific exercise. Sometimes this is due to issues relating to individual body mechanics. 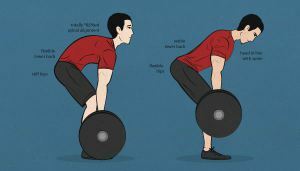 For example, we see patients who report knee pain when doing hack squats, but no pain when performing regular squats. Or, they may report knee pain when performing leg extensions on a BodyMasters brand machine, but not with a StarTrac brand machine. Others can do flat bench presses with dumbbells without any problem, but if they use a barbell they are stopped dead in their tracks with pain. The examples are endless. If you are not willing to seek professional evaluation to determine your underlying problem and get it fixed, then the simplest solution is to avoid those exercise movements that you know from experience are causing you pain or are just not safe for you. Unfortunately, for some, this easier said than done. Sadly, and too often, people get “brainwashed” by articles they read on the internet or by comments from people in the gym into believing that if you don’t perform certain “critical” exercises, your fitness or bodybuilding dreams will all come to an end. Deadlift, they say, or else you will never have a decent back. 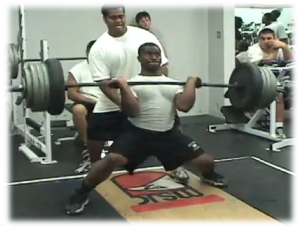 Squat, or else you won’t be able to develop your legs. Bench press or else your chest muscles won’t develop. Do it or else you’ll get nowhere, they say. Such advice could not be more misguided. And, even worse, if you believe these “know nothings” and insist on doing exercises that hurt you, you will sabotage your body. Your physical development will only be compromised in the long term. Your workouts will be less effective as you try to train through pain or you will eventually miss training time entirely while your injury heals (hopefully). Progress will only take longer as you gradually attempt to regain any of the size or strength you lost. In short, people make less progress when they are hurt. Think about it. Certain areas like the lower back and shoulders are involved in the performance of so many different movements that if you hurt them badly, your exercise program may be severely compromised. Is that what you want? Achieving the highest levels in fitness or bodybuilding often involves training around injuries, correcting body imbalances and utilizing all the available “tools” in the gym. At Performance Sport-Care in Walnut Creek, we are experts at this. You can build a great back without deadlifts. You can develop terrific legs without squats. We have developed “work arounds” for all sorts of exercise/training problems that deliver big time results! 1) If you have existing pain or past injuries that are aggravated by certain exercises, you are being foolish if you insist on doing them. It doesn’t matter if they are ‘must do’ exercises according some internet personality or some guy in the gym. 2) As early as possible, pain or problems need to be recognized and the reason(s) for them should be accurately determined.Then get them fixed! 3) An objective evaluation by a professional that is truly experienced in exercise, strength training, and injury can be very valuable in identifying your problem(s) and getting them fixed. 4) Be open minded to the possibility that your exercises could be performed in a better fashion or that alternative exercises might suit you better. 5) Be your own person. Listen to your body. Don’t believe everything that is said in the gym or on the internet.